Natural wooden hair brush, perfect for detangling hair with ease, even when wet. Suitable for curly, thick or oily hair. The nylon pins, thanks to their flexibility, detangles hair with ease, even when wet. Perfect for fragile or easy tangle hair, the nylon pins bend and avoid hair loss and split ends. Ball tips together with the rubber cushion protect and gently massage the scalp. Very resistant beech wooden handle. Enfin une brosse qui ne casse pas les cheveux! J'ai enfin trouvé la brosse qui n'arrache pas mes cheveux. Les picots sont tout doux et démêlent sans effort. Je l'utilise aussi pour ma fille qui arrête enfin de hurler à chaque démêlage! Natural wooden hair brush, perfect for detangling and smooting thanks to the nylon and boar bristles combination. Suitable for fine, straight or dry hair. Wooden hairbrush, perfect for creating volume or straightening the hair! Natural wooden brush, perfect for detangling hair with ease, even when wet Suitable for curly, thick or oily hair. Natural wooden hairbrush, perfect for detangling and smoothing the hair. Suitable for fine, straight or dry hair. Natural wooden brush with 100% boar bristles. Perfect for babies fragile hair and scalp. The perfect accessory to protect your hair brush or your make up brushes in your purse or your cosmetic bag. Perfect to transport your beauty essentials in your purse or your suitcase. The best assortiment for a natural beauty. The perfect new born gift! 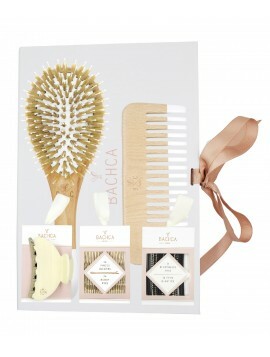 For baby: 100% boar bristles hairbrush + Enfance Shampoo 0-3 year to take care of the first finest hair. For mom: detangling brush with soft bristles, perfect for fragile hair after new born.